Tungsten carbide button insert is a mining and drilling tool used for oil-field drilling, hard rock drilling and geological exploration. With excellent wear resistance and impact toughness, it has higher drilling speed compared to similar products. Our carbide button bits have long service cycle that is 5 to 6 times longer than buttons of similar diameter. Our tungsten carbide button inserts can accelerate your work speed and relieve workers’ burden. Carbide button bits are also indispensable parts of coal cutter drilling tools, mining machinery and road maintenance tools. They fit perfectly on roller cone bits, DTH bits, drifter bits, etc. 1. Tongyi carbide button bits are mainly small and medium-sized carbide buttons and they are mainly used to fit in cone bits, percussion drilling tools and drilling blades. 2. All of our products are manufactured under severe supervision. 3. Every batch of material is tested in density, HRA, TRS and magnetic saturation. Tested results are filed and supervised. 4. Our tungsten carbide button inserts are manufactured in strict accordance with ISO standards with high precision. 5. We offer customized services for carbide button bits according to clients’ requirements. Samples and quotations can be obtained upon our receipt of your further requirement. This tungsten carbide button insert is made from high-purity raw materials. It is of very high quality and excellent performance. Conical carbide button bits are used as impact drill bits, down-the-hole drill bits and roller bits. They can be used for the drilling of mining drill bits, oil well, water well, and so on. This tungsten carbide button insert is an important part of drilling tools. It is usually fitted on the head of the bit. 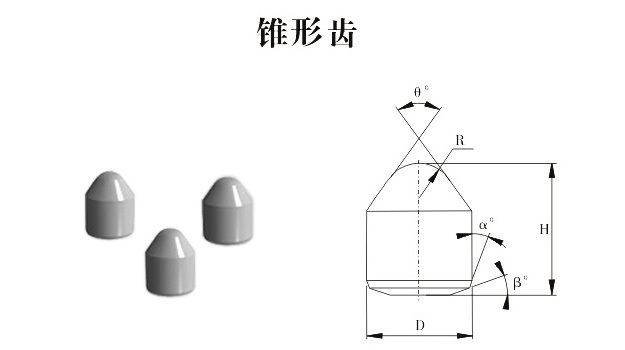 There are spherical, ballistic and semi-ballistic buttons. Different shapes of buttons are chosen according to the nature of rock formation. Our carbide button bits for coal mining drill have good wear resistance, high level of toughness, consistent quality and excellent performance as a result of the use of superior powder, modern manufacturing facilities and stringent quality management system. They can be applicable for tunneling works, geological prospecting, oilfield development and exploitation, coal mining, architecture industry, and so on. YK25 K40 14-.3-14.6 ≥ 2100 ≥ 86.5 Qualified for molding the drills for heavy-duty rock drill, detachable bits used for deep hole drilling, rock drill trolley, etc. YG15 K40 13.9-14.1 ≥ 2020 ≥ 86.5 Qualified for hard rock drilling, steel bars with high compression ratios, pipe drawing, punching tools, core cabinet of powder metallurgy automatic molders, etc. YG16C 13.7-14.1 ≥ 2400 ≥ 84.0 Forging dies with impact resistance, hot dies, etc. YG20 13.4-14.8 ≥ 2480 ≥ 83.5 Qualified for making dies with low impact such as punching watch parts, battery shells, small screw caps, etc. YG20C 13.4-14.8 ≥ 2480 ≥ 82.5 Qualified for making moulds of cold heading, cold stamping and cold pressing used for manufacturing standard parts, bearings, etc. Zhuzhou Tongyi Industry Co., Ltd. is a professional manufacturer of carbide products in China. The company has acquired the certificate of ISO quality management system. Our carbide button bits are manufactured under strict quality control system. Products have been exported to dozens of countries, such as the United States, Canada, Germany, Poland, Brazil, Saudi Arabia, Iran, Turkey, Russia, etc. 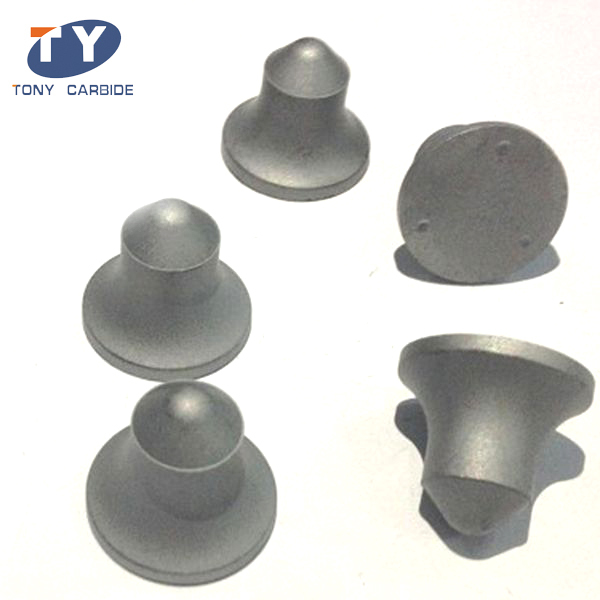 Tongyi tungsten carbide button inserts are highly appraised.